Oregon is a state in the Pacific Northwest region of the United States. It is located on the Pacific coast, with Washington to the north, California to the south, Nevada on the southeast and Idaho to the east. 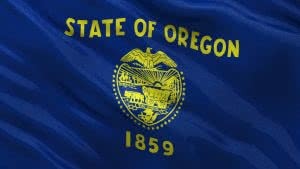 Oregon is the 9th most extensive and the 27th most populous of the 50 United States. Salem is the state’s capital and third-most-populous city; Portland is the most populous. Portland is the 29th-largest U.S. city, with a population of 583,776 (2010 US Census) and a metro population of 2,241,841 (2009 estimate), the 23rd-largest U.S. metro area. Oregon’s major industries include agriculture, timber, and technology. Names of Oregon corporations must be distinguishable from name of any existing entity, reserved, registered or assumed business names. Company Express will research your company name to make sure it meets Oregon’s standards. Time to file: Oregon requires corporations to file an annual report on or before the anniversary date of the incorporation. The filing fee is $100. Filing extensions: Permitted. One extension of 45 days is allowed. Names of Oregon Limited Liability Companies must be distinguishable from the name of any existing entity, reserved, or assumed business names. Company Express will research your company name to make sure it meets Oregon’s standards. Time to file: Oregon requires LLCs to file an annual report on or before the anniversary date of the incorporation. The filing fee is $100. Filing extensions: Permitted. LLC can apply for an extension of 45 days.